Who as vice president and general manager of Phelps Dodge Corporation conceived and carried out this plan for making the hitherto unprofitable low grade copper bearing rock of the area into a commercial copper producing ore.
His dynamic leadership, his comprehensive knowledge of all phases of mining will continue to be an inspiration to his fellow engineers. Location. 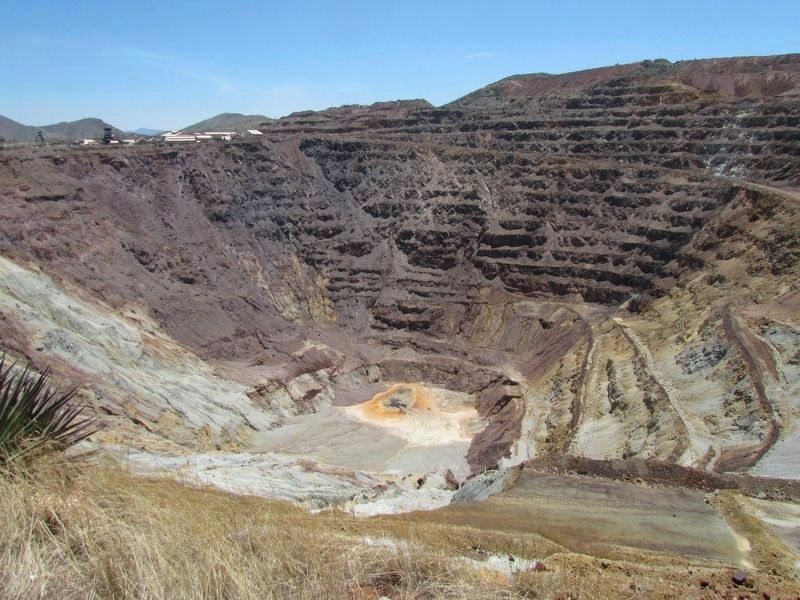 31° 26.152′ N, 109° 54.028′ W. Marker is in Bisbee, Arizona, in Cochise County. Marker is on Arizona Route 80 at milepost 343, on the right when traveling east. Touch for map. 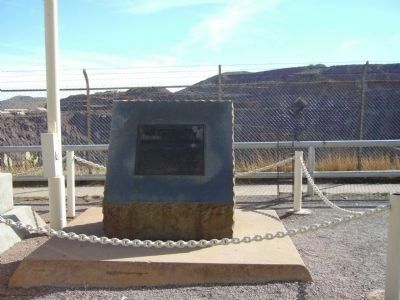 Marker is in this post office area: Bisbee AZ 85603, United States of America. Touch for directions. Other nearby markers. At least 8 other markers are within 3 miles of this marker, measured as the crow flies. City of Bisbee Warrior Memorial (approx. 0.8 miles away); Brewery Gulch (approx. 0.9 miles away); Phelps Dodge General Office Building (approx. 0.9 miles away); Copper Queen Plaza (approx. 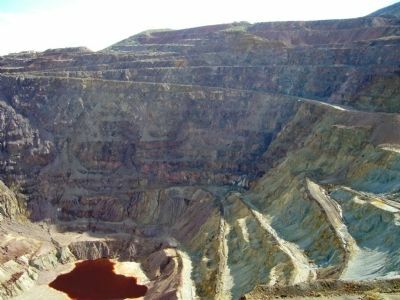 0.9 miles away); Discovery of Ore (was approx. one mile away but has been reported missing. ); Walter Douglas House (approx. 1.8 miles away); Calumet and Arizona Mining Company Office Building (approx. 2.1 miles away); The Warren Ball Park (approx. 2.1 miles away). Touch for a list and map of all markers in Bisbee. 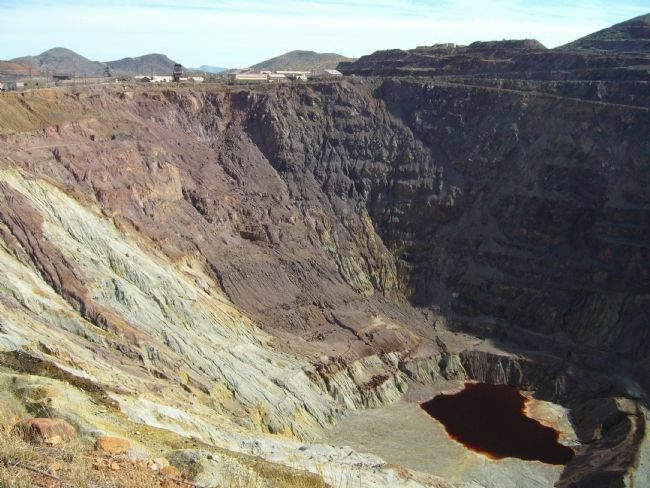 The rim of the pit can be seen in the background. More. 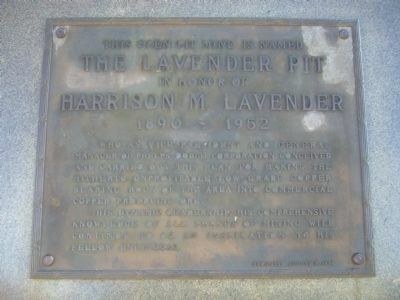 Search the internet for The Lavender Pit. Credits. This page was last revised on May 9, 2017. This page originally submitted on March 7, 2010, by Bill Kirchner of Tucson, Arizona. This page has been viewed 1,156 times since then and 8 times this year. Photos: 1, 2, 3, 4. submitted on March 7, 2010, by Bill Kirchner of Tucson, Arizona. 5. submitted on May 9, 2017, by Bob (peach) Weber of Prescott Valley, Arizona. • Syd Whittle was the editor who published this page.